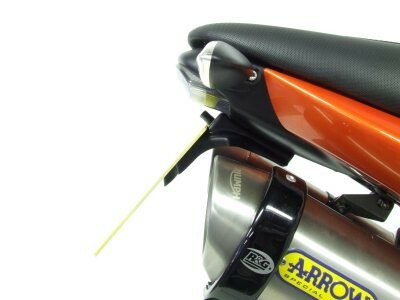 This Tail Tidy is suitable for The Aprilia RSVR/Factory '04-'07 models onwards and the Tuono 2006 onwards models. Replacing the stock licence plate holder with a much smaller licence plate holder giving the bike back its sporty look! 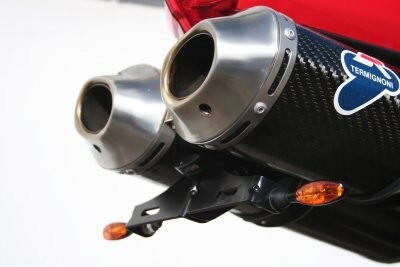 This Tail Tidy is suitable for the Honda CBR600RR ('03-'06 models) and CBR1000RR Fireblade (2004-2007 models). Replacing the stock licence plate holder with a much smaller licence plate holder giving the bike back its sporty look! This Tail Tidy is suitable for the Kawasaki ZX6-R C1H ('05) and the ZX6-R C2H ('06 bikes. 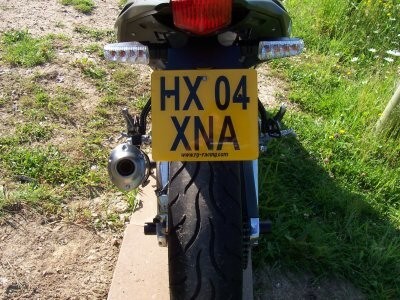 Replacing the stock licence plate holder with a much smaller licence plate holder giving the bike back its sporty look! 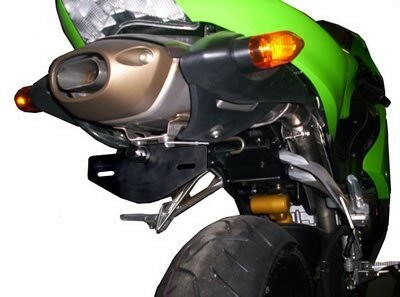 This Tail Tidy is suitable for the Kawasaki ZX10-R (2004-2005 models). 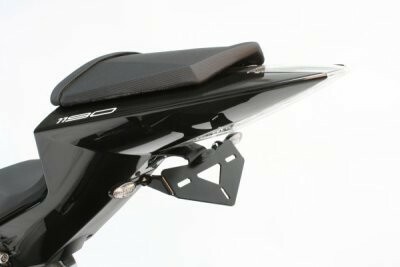 Tidy up your bike's rear end with this R&G Tail Tidy/Licence Plate Holder for the Suzuki SV650 '03-'06 models and SV1000. Made from Stainless Steel plate and powder coated black for durability and a high quality finish. Supplied with an licence plate light. Compatible with our R&G Micro indicators (RG370/RG371) and other indicators with an 8mm threaded stork, or the OEM indicators. 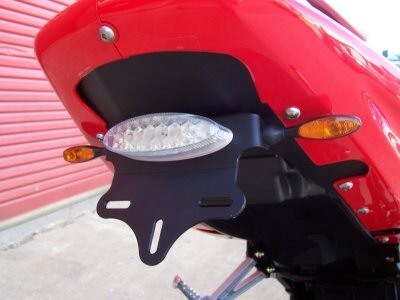 This Tail Tidy is suitable for the Suzuki GSXR1000 K3-K4 models. Replacing the stock licence plate holder with a much smaller licence plate holder giving the bike back its sporty look! 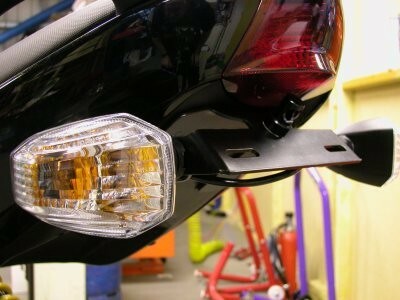 This Tail Tidy is suitable for the Suzuki GSXR1000 K5-K6 models. Replacing the stock licence plate holder with a much smaller licence plate holder giving the bike back its sporty look! 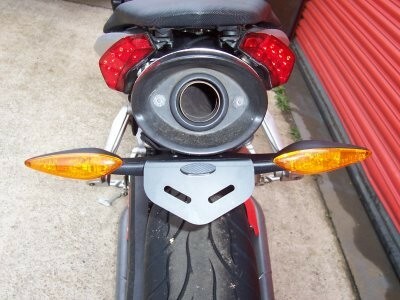 This Tail Tidy is suitable for the Triumph Sprint ST 2005 onwards. Replacing the stock licence plate holder with a much smaller licence plate holder giving the bike back its sporty look! 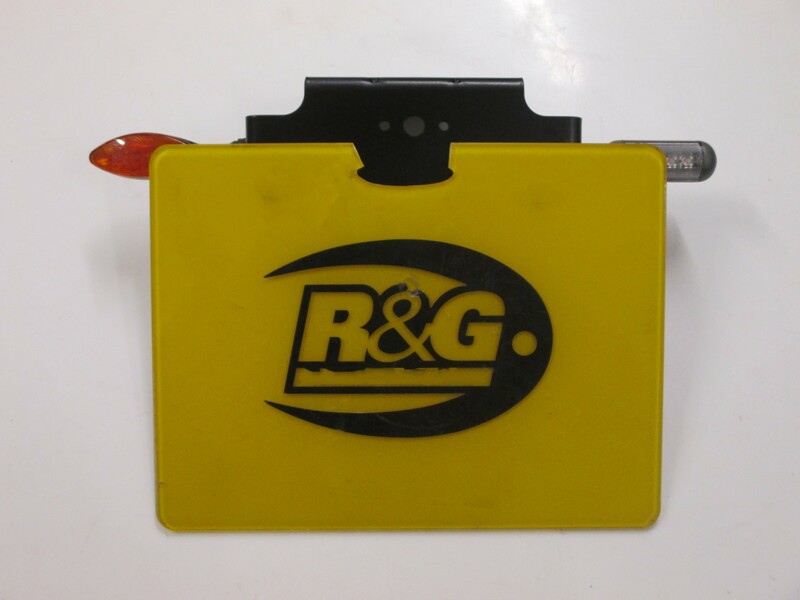 Tidy up your rear end with this R&G Tail Tidy/Licence Plate Holder! Suitable for the Triumph Speed Triple '05-'07. Replacing the stock licence plate holder with a much smaller licence plate holder giving the bike back its sporty look! 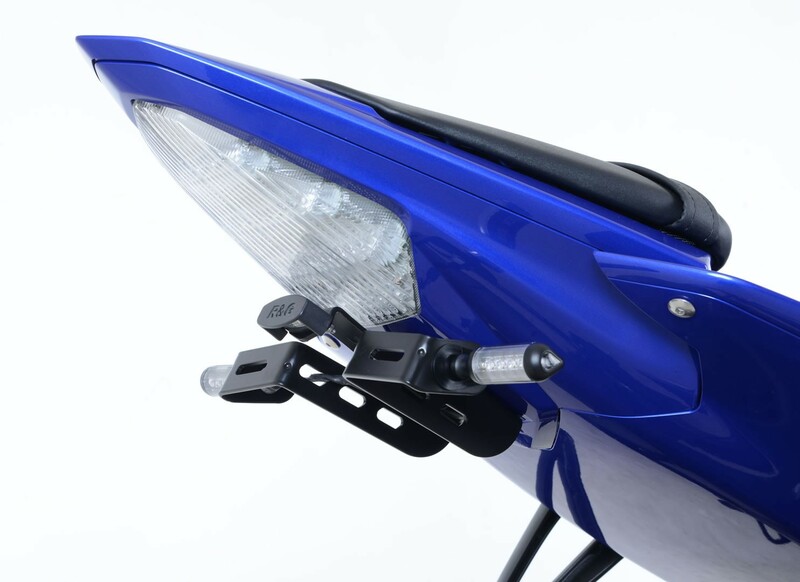 This Tail Tidy is suitable for the Yamaha YZF-R6 (2003-2005) and the YZF-R1 (2002-2003). 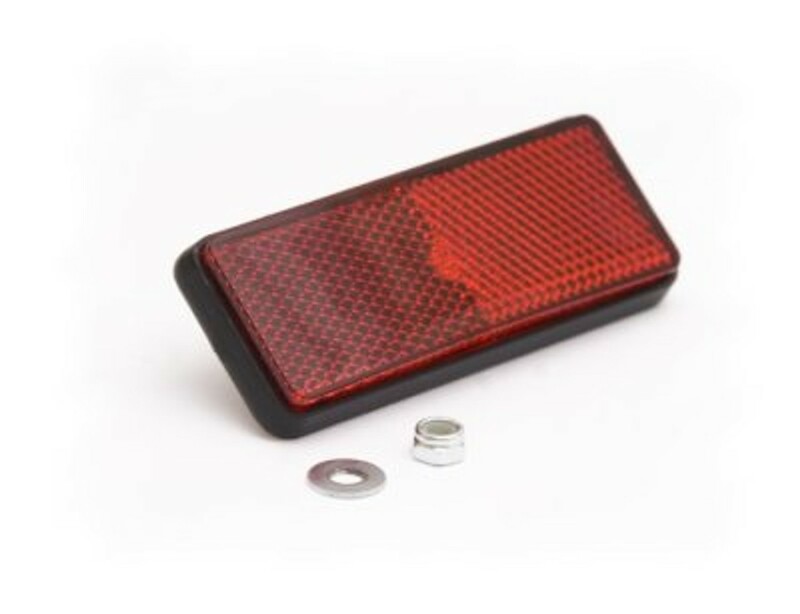 This product uses micro indicators which might require the fitting of RGR0001 resistors Please note you will need to fit a smaller licence plate than one that meets UK legal requirements to be able to have the use of side indicators. 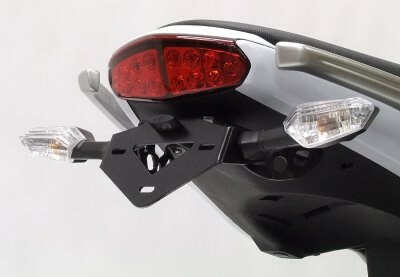 This Tail Tidy is suitable for the Yamaha YZFR1 (2004 - 2006). Replacing the stock licence plate holder with a much smaller licence plate holder giving the bike back its sporty look! 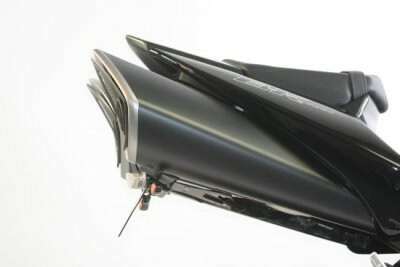 Radically smarten up the rear end of your YZF-R6 with this R&G Tail Tidy, Suitable for the Yamaha YZF-R6 (2006-2016). 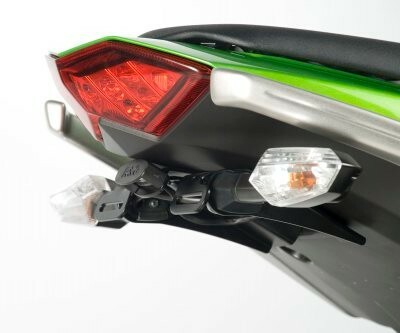 This Tail Tidy is suitable for the Kawasaki ZX10-R models ('06 - '07). Replacing the stock licence plate holder with a much smaller licence plate holder giving the bike back its sporty look! 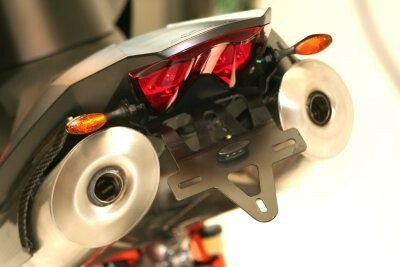 Suitable for the Suzuki GSXR600/750 K6-K7 models this Tail Tidy incorporates our replacement tail tidy light. 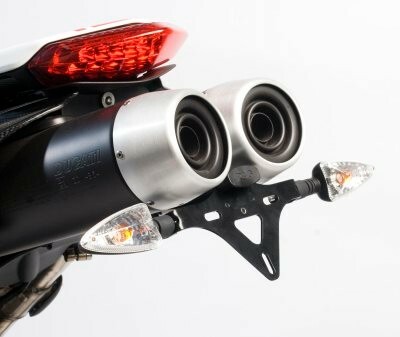 This Tail Tidy is suitable for the Triumph Daytona 675 and is compatible with the standard exhaust and Arrows oval exhaust. 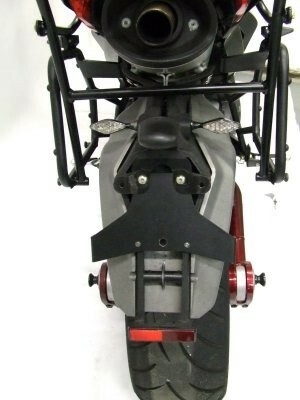 This Tail Tidy is suitable for the Yamaha FZ-1 (2006 onwards) and FZ8 models. 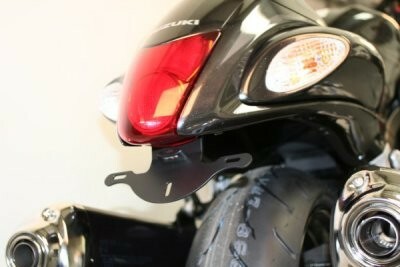 This Tail Tidy is suitable for the Kawasaki ER6 (Ninja 650R). Up to & including 2008. Replacing the stock licence plate holder with a much smaller licence plate holder giving the bike back its sporty look! 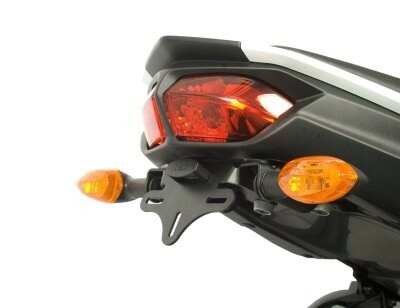 This Tail Tidy is suitable for the Yamaha Fazer 1000 (2006 models onwards). 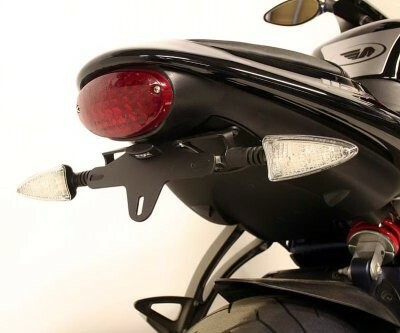 This tail tidy is suitable for the Triumph Daytona 675 with Arrow exhaust (upto 2012). Replacing the stock licence plate holder with a much smaller licence plate holder giving the bike back its sporty look! Suitable for the Aprilia SXV450 and SXV550 (suitable for all years), this Tail Tidy incorporates our replacement tail/stop light and can also take our Micro Indiciators (available separately - see Related Products). 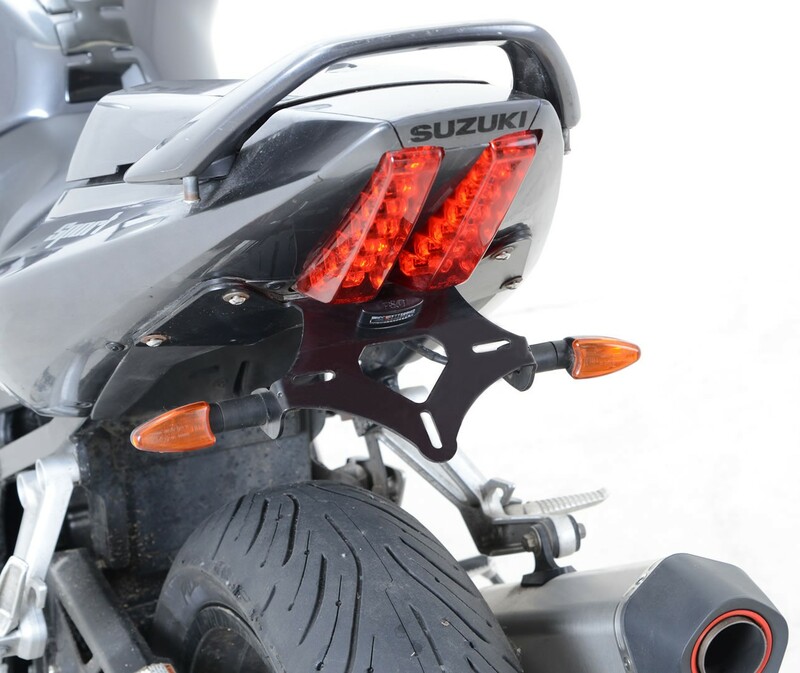 This Tail Tidy is suitable for the Suzuki GSXR1000 K5-K6 models. Please note this Bad Boy Tail Tidy may not be fully road legal. 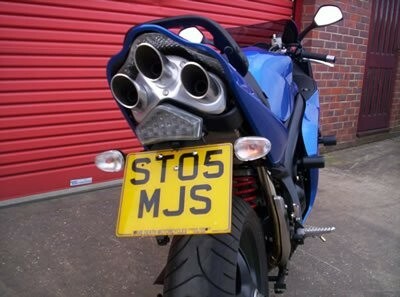 Replacing the stock licence plate holder with a much smaller licence plate holder giving the bike back its sporty look! 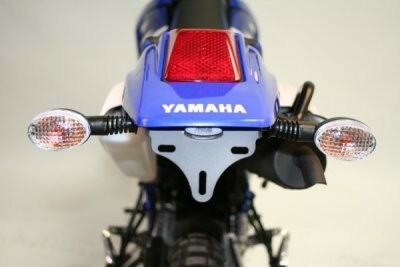 R&G Tail Tidy (Bad Boy Version) for the Yamaha WR250F '05-'06, WR450F '05-'06. 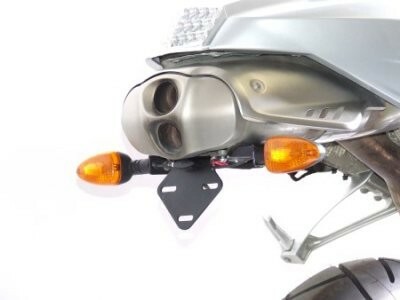 This Tail Tidy is suitable for the YYamaha WR250F '05-'06, WR450F '05-'06 models This product is not compatible with rear numberplate light - day use only. Replacing the stock licence plate holder with a much smaller licence plate holder giving the bike back its sporty look! 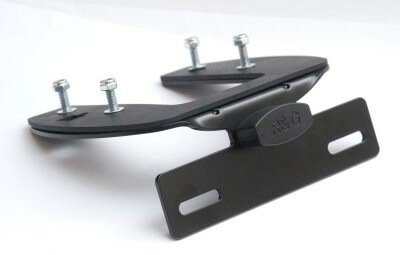 Made from alumiunium for strength and weight saving and powder coated black for a sharp look, R&G tail tidies are engineers and designed to tidy up the rear end of the bike, getting rid of those large OE licence plate brackets. Our units are easy to install, utilising existing mounts where possible. 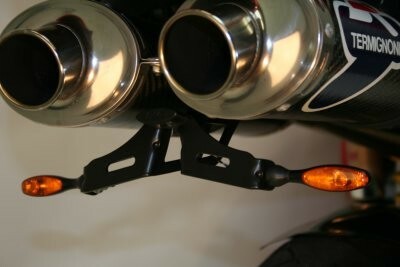 Powder coated black for a durable finish This tail tidy is suitable for the Benelli TNT and Benelli Cafe Racer. 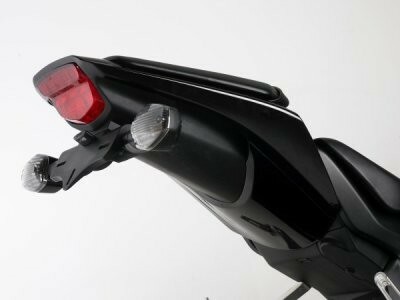 This Tail Tidy is suitable for Ducati 749/999 and includes a replacement stop and tail light. 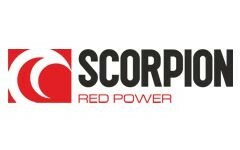 This product also includes R&G Micro LED Indicators which might require the fitting of RGR0002 Indicator Resistors (which are also supplied). 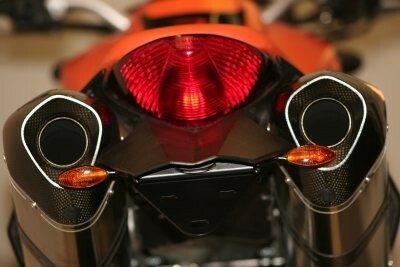 This Tail Tidy is suitable for the Kawasaki ZZR1400 (ZX-14). 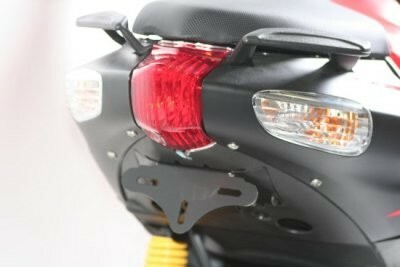 This tail tidy is suitable for the Hyosung GT125, GT125R, GT250, GT250R >'08, GT650R & GT650S models. 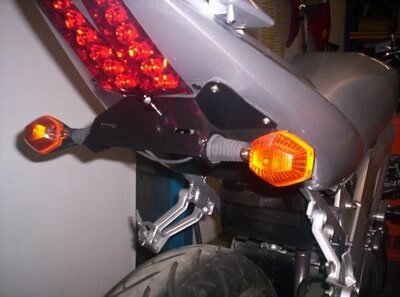 This tail tidy includes a replacement R&G tail/stop light as well as replacement R&G Micro LED Indicators and R&G LED Resisters (included in with the kit). 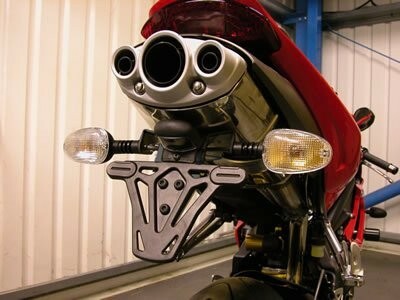 This Tail Tidy is suitable for Ducati 748 / 916 / 996 & 998. 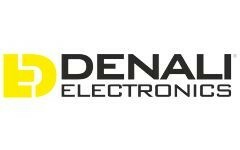 This product also includes R&G Micro LED Indicators which might require the fitting of RGR0002 Indicator Resistors (which are also supplied). 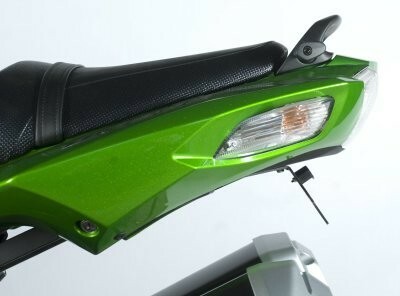 This Tail Tidy is suitable for the Kawasaki Versys 650 '06-'09. 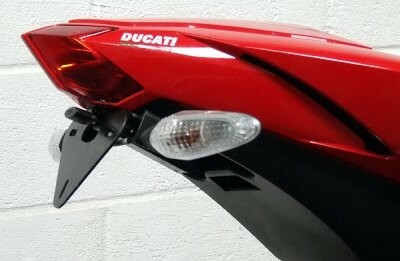 Suitable for the Ducati 848 & 1098S, this tail tidy incorporates our replacement tail tidy number plate light. This product also includes R&G Micro LED Indicators which might require the fitting of RGR0002 Indicator Resistors (which are also supplied). 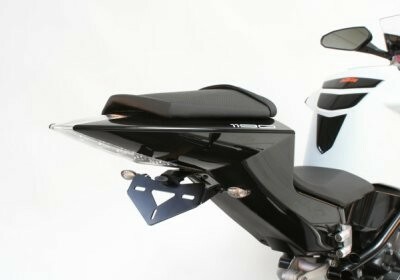 This Tail Tidy is suitable for the Yamaha YZF-R1 '07-'14. 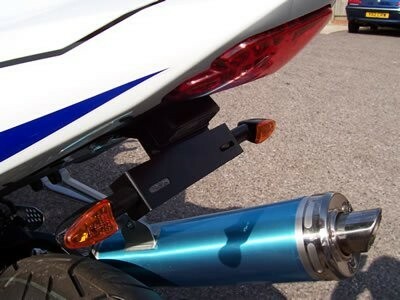 This tail tidy is suitable for the Suzuki GSX-R1000 K7 & K8. Replacing the stock licence plate holder with a much smaller licence plate holder giving the bike back its sporty look! 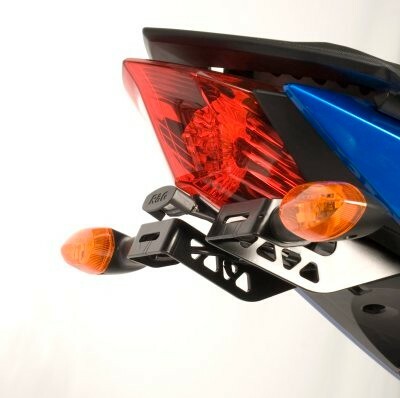 This Tail Tidy is suitable for the Honda CBR600RR '07-'12 and it includes the replacement rear light unit. 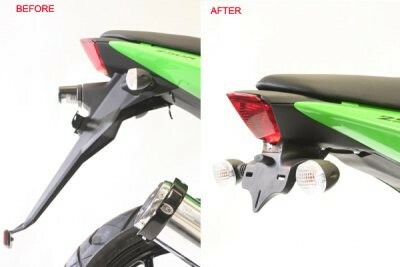 This Tail Tidy is suitable for the Kawasaki ZX6R '07-08. Note: This item is not compatible with the Superduke 990 R models. 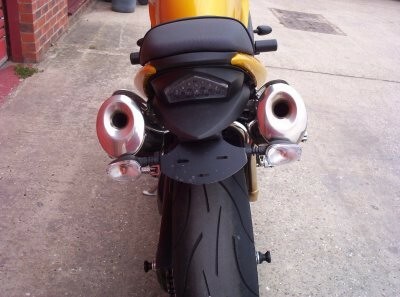 This tail tidy is suitable for the Cagiva Mito 125 models. Replacing the stock licence plate holder with a much smaller licence plate holder giving the bike back its sporty look! 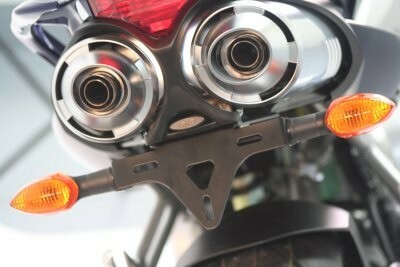 This tail tidy is suitable for the Yamaha Fazer 600 '04 onwards and the Yamaha FZ6 from '04 onwards. 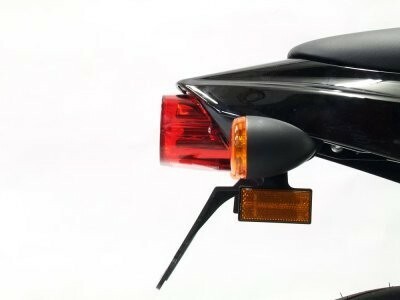 This tail tidy is suitable for the Honda CBR954 '02-'03 models. Replacing the stock licence plate holder with a much smaller licence plate holder giving the bike back its sporty look! 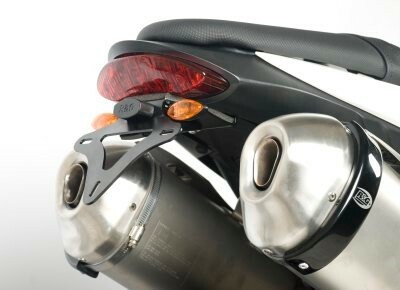 This tail tidy is suitable for the BMW R1200S. Tidy up your rear end with our hugely popular tail tidy / licence plate holder! 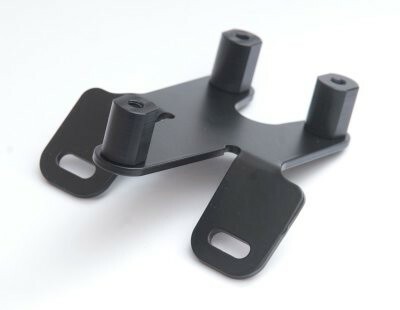 This tail tidy is suitable for the BMW G650 X Challenge, G650 X Country and the G650 X Moto models. Note: This tail tidy comes supplied with R&G LED Micro Indicators and R&G LED Indicator Resistors in the kit. 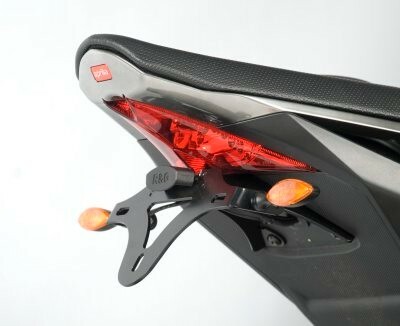 This Tail Tidy / Licence Plate Holder is suitable for the KTM 990R Super Duke (upto 2011 - Not suitable for the 2012 990Duke R) and includes our micro indicators and tail tidy light (this tail tidy is NOT suitable for the 990 Super Duke standard edition). 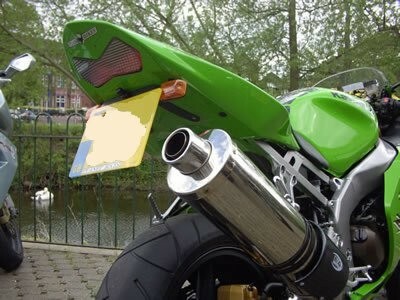 Note: if fitting an Akrapovic can with this tail tidy, please be aware that you will not be able to fit a standard UK number plate. 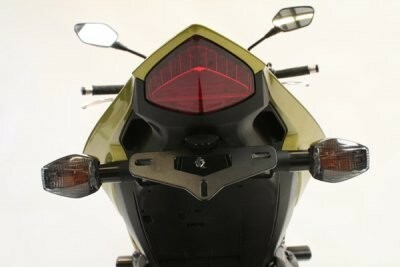 Please note this tail tidy comes with our LED Micro Indicators. 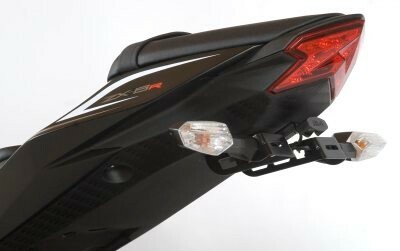 This Tail Tidy / Licence Plate Holder is suitable for the 690 Duke III '08-'11 and the 690SM (all years), and includes our replacement tail tidy light. 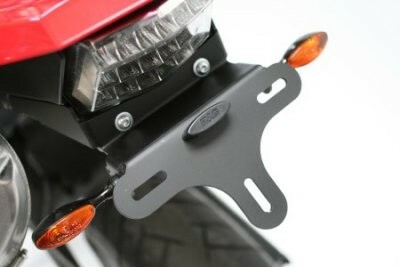 This Tail Tidy / Licence Plate Holder is suitable for the Yamaha DT125R '07- and DT125X '07- and includes our replacement tail tidy light. Replacing the stock licence plate holder with a much smaller licence plate holder giving the bike back its sporty look! 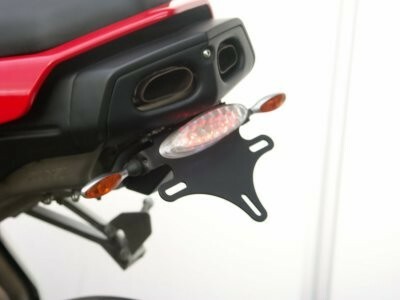 This Tail Tidy / Licence Plate Holder is suitable for the Ducati Hypermotard 796 and the Hypermotard 1100 and includes our replacement tail tidy light. 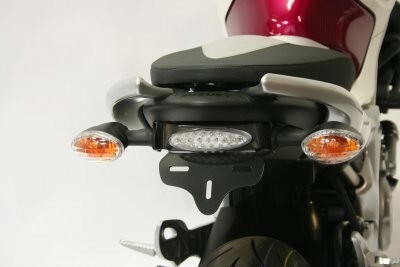 This Tail Tidy / Licence Plate Holder is suitable for the Triumph Street Triple 675 '07-'12 and the Street Triple R '08-'12 and includes our replacement tail tidy light. Replacing the stock licence plate holder with a much smaller licence plate holder giving the bike back its sporty look! 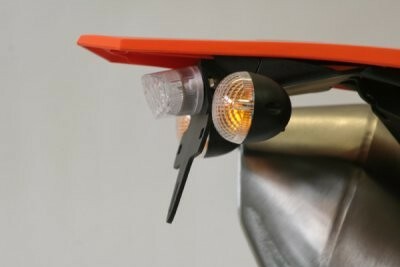 Mini indicators mount by attaching to number plate illumination light (LA002) mount. OEM indicators mount into undertray. 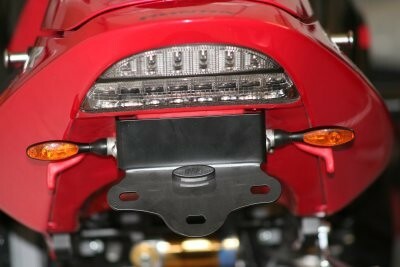 This Tail Tidy / Licence Plate Holder is suitable for the Aprilia Shiver and includes our replacement tail tidy light. 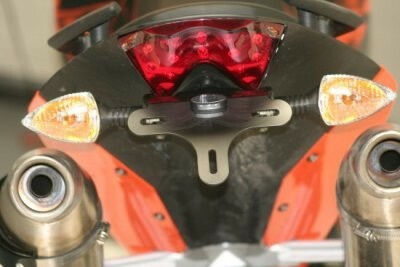 This Tail Tidy / Licence Plate Holder is suitable for the Aprilia RSV Mille '01-'-3 & the Tuono up to '05. 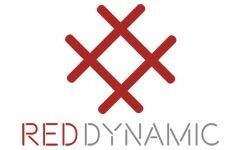 and includes our replacement tail tidy light. 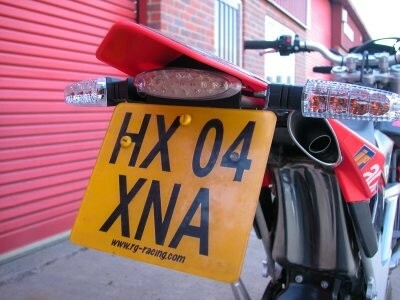 Replacing the stock licence plate holder with a much smaller licence plate holder giving the bike back its sporty look! 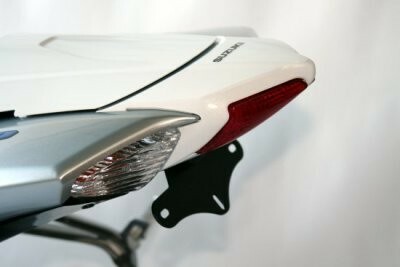 This Tail Tidy / Licence Plate Holder is suitable for the Suzuki GSX1300R Hayabusa '08- and includes our replacement tail tidy light. 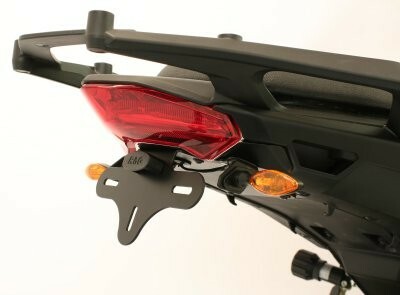 This Tail Tidy / Licence Plate Holder is suitable for the Suzuki B-King '07- and includes our replacement tail tidy light. 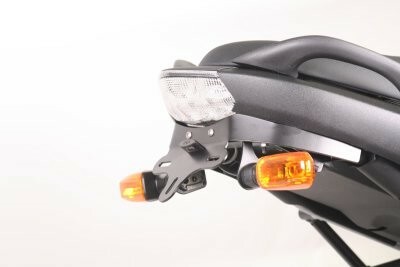 Tidy up your scooter's rear end with this R&G Tail Tidy/Licence Plate Holder! 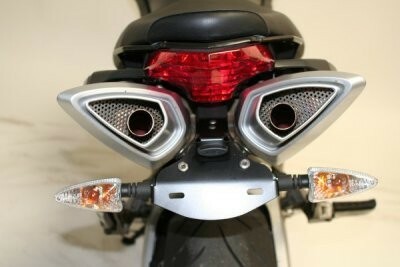 Suitable for the Aprilia SR50 '05-. 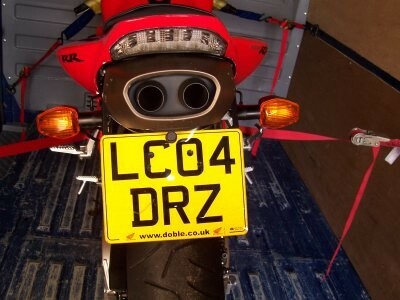 Tidy up your bike's rear end with this R&G Tail Tidy/Licence Plate Holder! 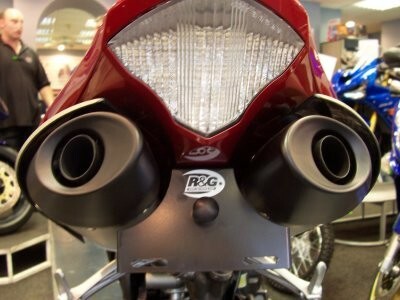 Suitable for the Honda CBR1000RR Fireblade '08-'11. 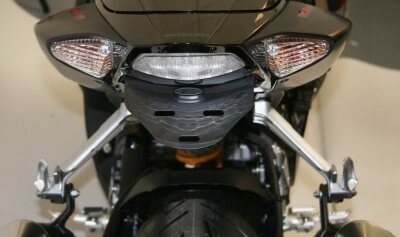 Tidy up your bike's rear end with this R&G Tail Tidy/Licence Plate Holder! 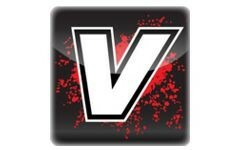 Made from 3mm aluminium for lightweight yet strong performance and powdercoated black for a durable and stylish finish. 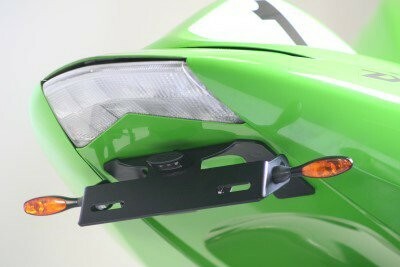 Suitable for the Kawasaki ZX10-R '08-'10 & ZX-6R '09-'18 this tail tidy incorporates our replacement tail tidy light. 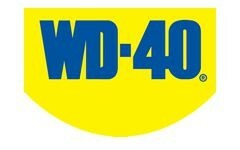 Original (OEM) or mini / micro indicators can be fitted - see related products for R&G Micro Indicators. 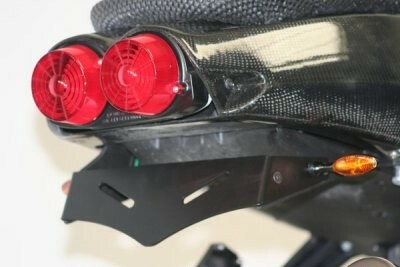 Suitable for the Suzuki GSX-R600 and GSX-R750 K8 onwards this Tail Tidy incorporates our replacement tail tidy light. Replacing the stock licence plate holder with a much smaller licence plate holder giving the bike back its sporty look! 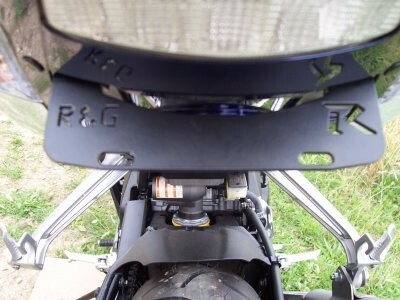 Tidy up your rear end with this R&G Tail Tidy/Licence Plate Holder! 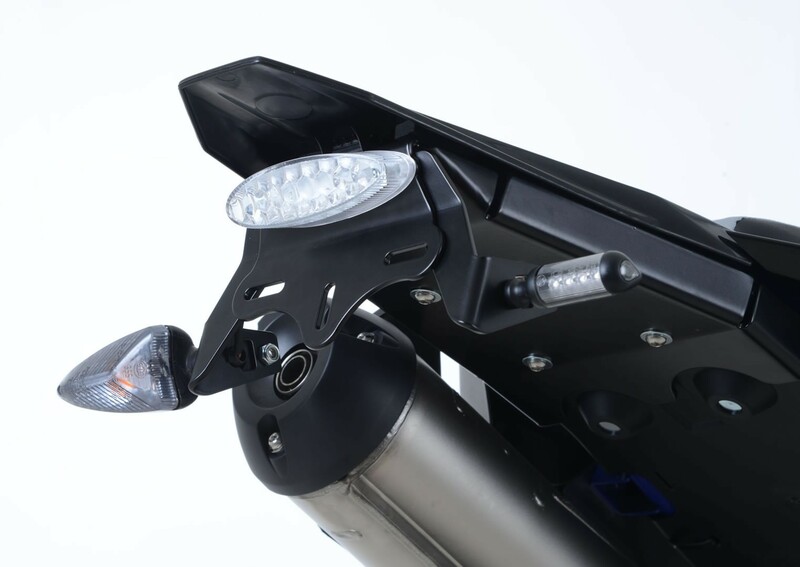 Suitable for the KTM RC8 '08- models this Tail Tidy incorporates our replacement R&G (Bulb Type) Micro Indicators within the kit. Since this product uses R&G (bulb type) Micro Indicators (supplied in the kit) it might require the fitting of RGR0001 resistors (not included) to correct the flash rate of the indicators. Note: a version without the Micro Indicators is available - please see Related Products. 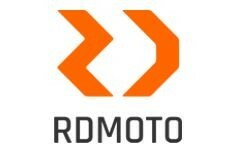 Suitable for the KTM RC8 '08- models. Note: micro indicators not included - see alternative product. 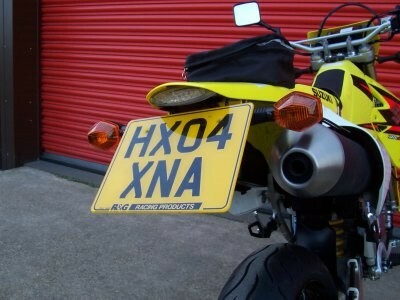 Replacing the stock licence plate holder with a much smaller licence plate holder giving the bike back its sporty look! 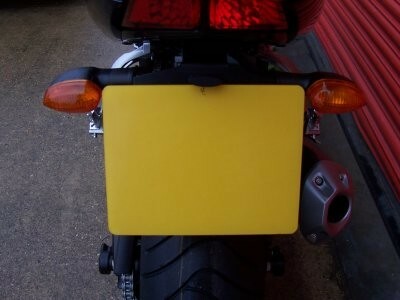 Tidy up your rear end with this R&G Tail Tidy/Licence Plate Holder! 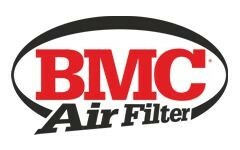 Suitable for the Honda CB1000R '08-'17 models. 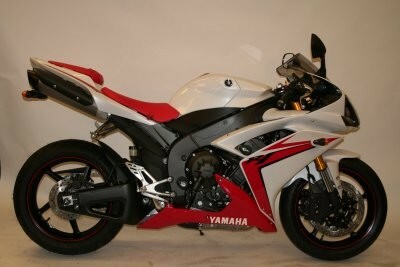 Suitable for the Yamaha YZF-R125 '08-'13 onwards models. 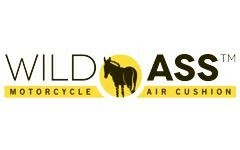 Suitable for the Kawasaki ZX250 (Ninja 250R) '08-'12 models. 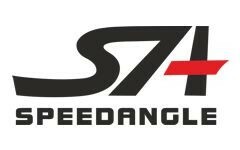 Suitable for the Triumph Speed Triple '08 models onwards. 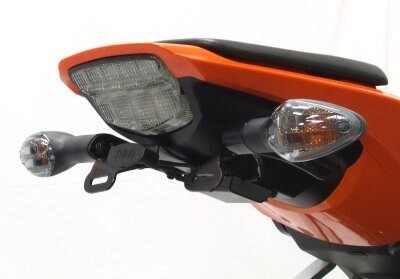 Suitable for the KTM 690 Enduro '08-, 690 SMCR '12-'18 and 690SMC '08-'11 models this Tail Tidy incorporates our replacement tail tidy light. Suitable for the Ducati Streetfighter (1098). 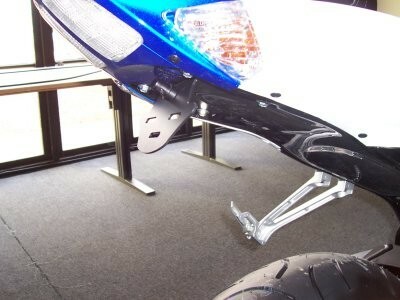 This tail tidy is suitable for the Suzuki GSX-R1000 K9-. 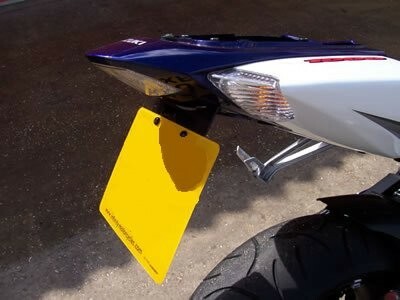 Replacing the stock licence plate holder with a much smaller licence plate holder giving the bike back its sporty look! 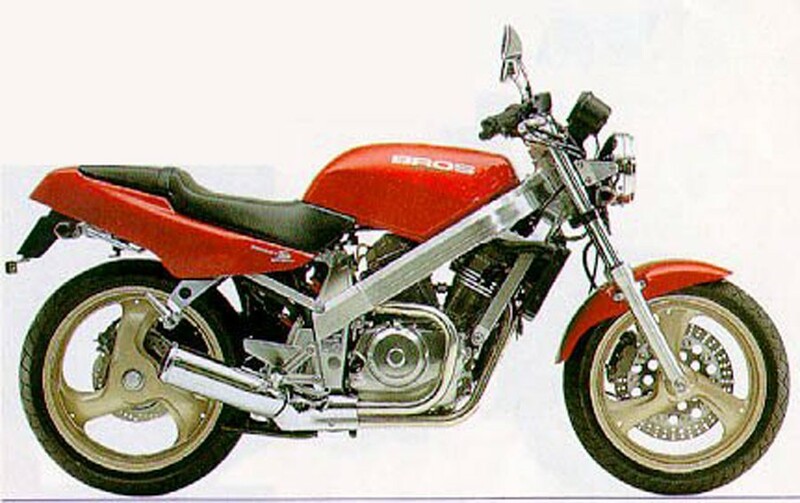 Suitable for the Yamaha XJ6 '09 models. 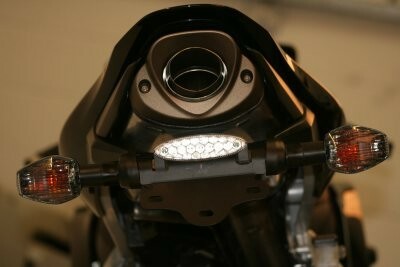 Radically smarten up the rear end of your ER6 with an R&G Tail Tidy. 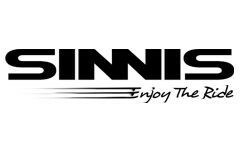 Suitable for the Kawasaki ER6 (Ninja 650R) '09-'11 models. 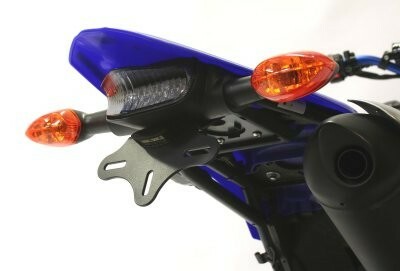 This Tail Tidy is suitable for the Yamaha WR250X '08- and Yamaha WR250R '08-. 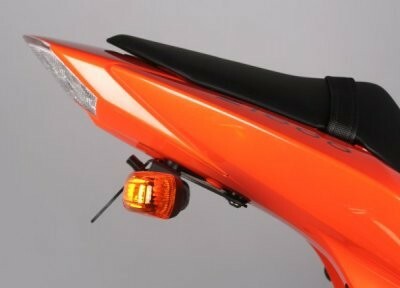 (Not suitable for WR250F) Please note - This will not fit the USA/CA models with the larger rear tail light. 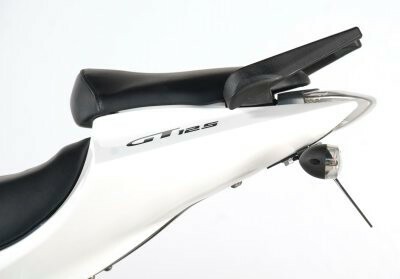 This Tail Tidy is suitable for the Suzuki Gladius 650 models from 2009 onwards. 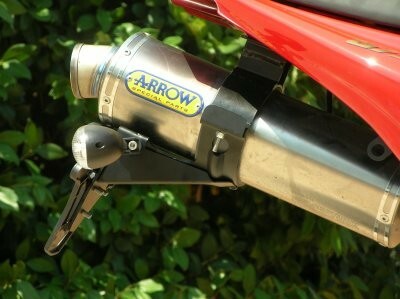 This Tail Tidy is suitable for the Benelli Tre K '08- onwards models. Made from aluminium and powder coated black for a superb lightweight and long lasting finish, an R&G tail tidy dramatically smartens up the rearend of the bike, giving it a smarter and cleaner look. 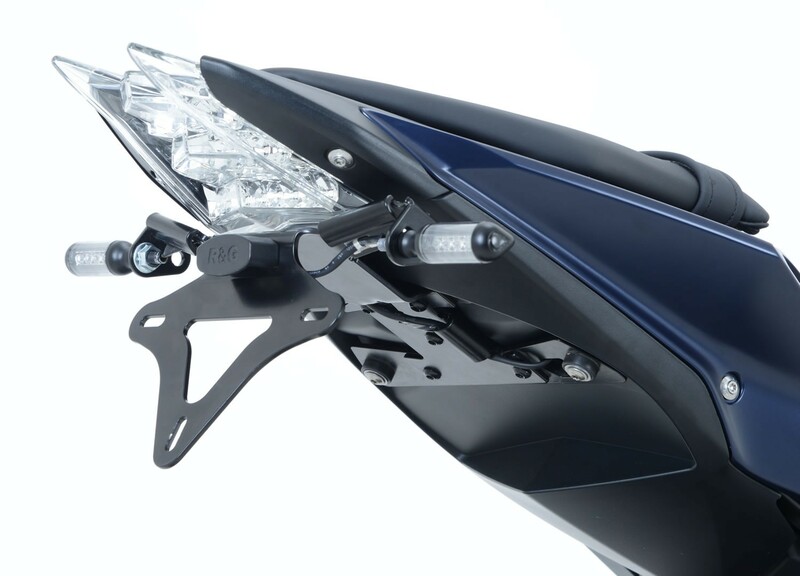 This Tail Tidy is suitable for the Yamaha WR125 R & X -09 onwards models. Comes complete with a stop and tail LED light. 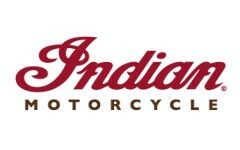 Suitable for the Buell 1125R '08- models. 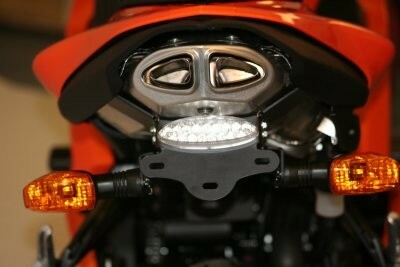 This Tail Tidy is suitable for the Harley Davidson XR1200 08 onwards models. Comes complete with a stop and tail LED light. 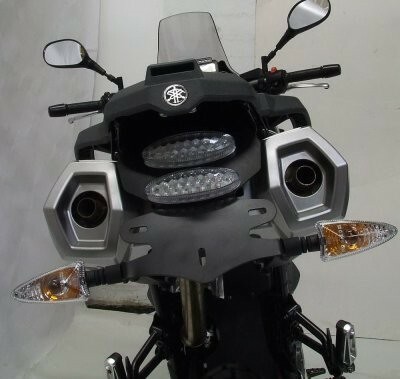 This Tail Tidy is suitable for the Yamaha XT660Z Tenere 08 onwards models. Comes complete with a stop and tail LED light and an additional rear light for improved rear visibility. 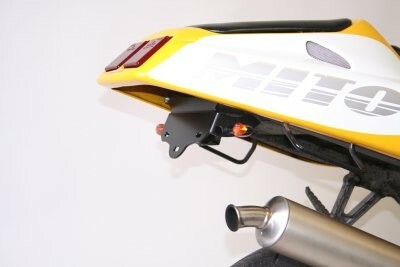 This Tail Tidy is suitable for the BMW S1000RR '10-'14, S1000R and HP4 (All Years). 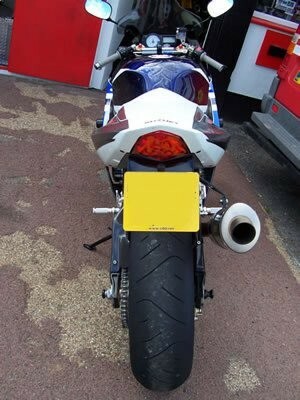 Tidy up your bike's rear end with this R&G Tail Tidy/Licence Plate Holder! 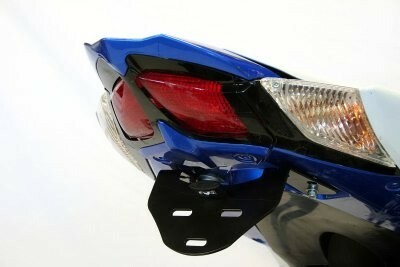 Aluminium Tail Tidy to suit the 2010-2011 CBR1000RR Fireblade. Our alternative tail tidy LP0063BK is also available for this bike. 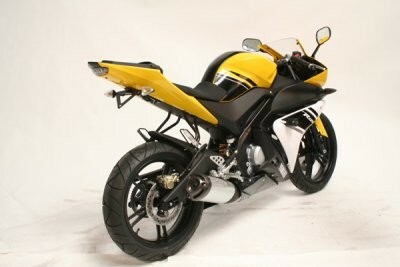 Suitable for the Honda CBR1000RR Fireblade 2010-2011 with and without ABS. 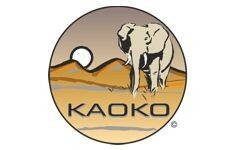 Original (OEM) or mini / micro indicators can be fitted - see related products for R&G Micro Indicators. 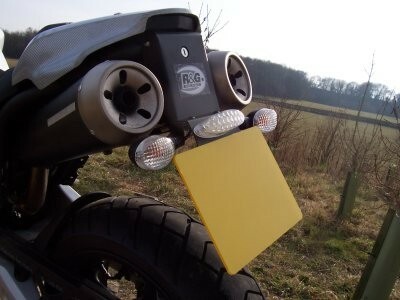 Tidy up your bike's rear end with this R&G Tail Tidy/Licence Plate Holder! Unfortunately this tail tidy is not suitable if Kawasaki pannier mounts are fitted. Original (OEM) or mini / micro indicators can be fitted - see related products for R&G Micro Indicators. 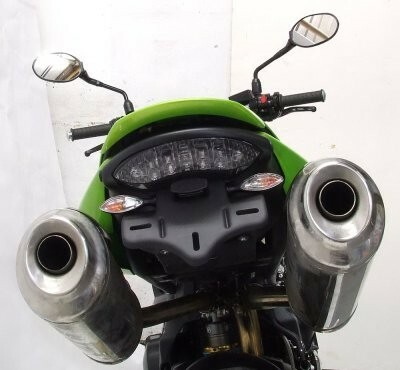 Suitable for the Kawasaki Z1000 (2010-2013 onwards). 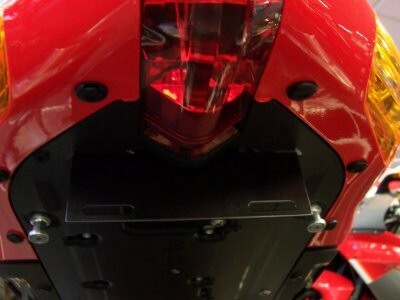 Tidy up your bike's rear end with this R&G Tail Tidy/Licence Plate Holder for the Ducati Multistrada 1200!